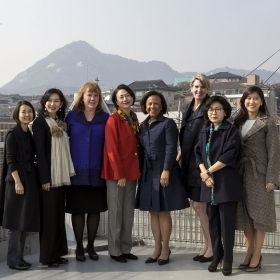 In March, President Paula Johnson and Wellesley colleagues traveled to six cities in three countries in Asia—Tokyo, Hong Kong, Nanjing, Shanghai, Seoul, and Beijing—meeting with more than 350 alumnae and parents at five different Alumnae Association club events. Over two weeks in March, President Paula Johnson and some Wellesley colleagues traveled to six cities in three countries in Asia—Tokyo, Hong Kong, Nanjing, Shanghai, Seoul, and Beijing—meeting with more than 350 alumnae and parents at five different Alumnae Association club events. The group took seven flights, one bullet train, half a dozen tours of cultural organizations and corporate headquarters, and countless selfies with alums. “Never before has the world more needed powerful, principled women. Never before has the world more needed those who have learned to think critically by experiencing a liberal arts education. Never before has the world more needed Wellesley. 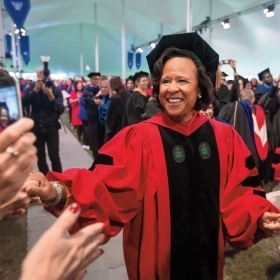 Never before has the world more needed every one of you,” President Johnson told alumnae.